Old cars can be like a neighborhood cat: When you see them sitting out in the summer, it can be hard to tell if someone loves them and is just letting them out, or if they are truly an abandoned stray. If they are still stuck outside when winter rolls around, then they are clearly a stray. I’ve seen this clearly unloved stray 1962 Chrysler New Yorker sitting out for years, and decided to make this my first CC. Chrysler scored a home run with its “Forward Look” styling from 1957-59. Suddenly it’s 1960 indeed. Alas, the actual 1960 model year Chryslers weren’t as well conceived, carrying some of the most overwrought, excessive styling ever to carry the Chrysler name (compare the featured car with a contemporary Lincoln Continental for a dramatic illustration of this). 1962 was a modest attempt to course correct. The most noticeable change was the complete elimination of tail fins, which by then had become unfashionable. The rear fenders are flat and flush with the trunkline, with the taillights neatly integrated with the trailing edges of the fender line. The rear fenders also tapered inward, giving the car some “hips.” The refreshed rear end is easily the most successful styling feature of this car. Unfortunately, the other remaining vestiges of 1950’s styling (diagonal headlights, wraparound rear window and swept back fender openings) would have to wait until the more comprehensive 1963 restyling before being removed. The market responded favorably to the styling improvements: Sales improved 32% over the 1961 models, to a total of 127,000 units, making 1962 easily the best-selling year of the 1960-62 generation Chryslers. 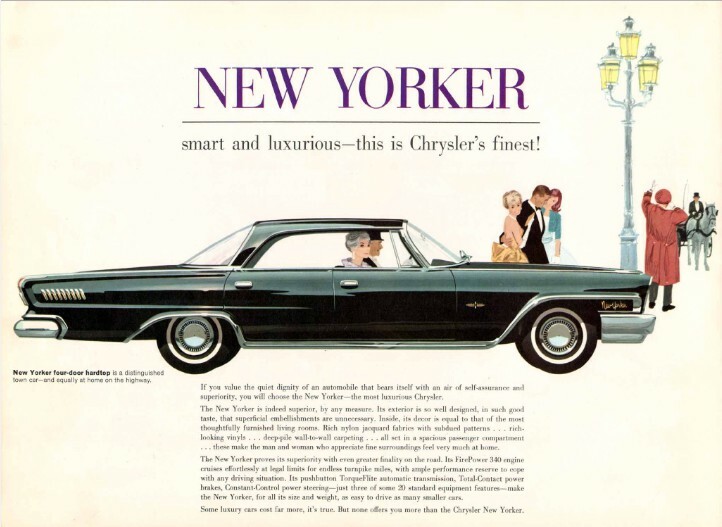 Our featured New Yorker represented the pinnacle of the Chrysler brand’s lineup for 1962 (recall that Imperial was still a separate brand at the time). It rode on an exclusive 126″ wheelbase, while the lesser Newport and 300 models rode on a 122″ wheelbase. This would be the final year the New Yorker carried this distinction: Starting in 1963, all models would ride on the smaller 122″ wheelbase. The four-door sedan body style this example wears outsold the four-door hardtop nearly 2-1, reflecting the waning popularity of the that body style. No two-door New Yorker was available (that was the domain of the 300), but Chrysler did offer a New Yorker Town and Country Station Wagon (not to be confused with the Newport Town and Country Station Wagon). With sales measuring in the hundreds, good luck finding one today. One oddity is that both the Newport and New Yorker wagons came only in hardtop versions. Befitting its position at the top of the line, the New Yorker sported a long list of standard equipment, including power steering, brakes, and windows, map lights, and a Torqueflite automatic transmission. Curiously, an AM radio, whitewall tires and even a heater/defroster were all still considered options, although I would guess that few, if any, were delivered without them. Also standard equipment on the New Yorker (optional on lesser Chryslers) was the 4-bbl. 413 cubic-inch RB (Raised Block) V8, good for 340 gross HP and 480 ft-lb. of torque. For an extra $486, one could upgrade to a dual 4-bbl. version of this engine, bumping the gross HP to 380 and torque to a stump-pulling 525 ft-lb. Given that the price of this engine represents over 10% of the price of the car, precious few were sold with this option. I was unable to open the hood on this article’s featured car, but I would guess it has the more common single-carb setup. I have saved the best part for last. 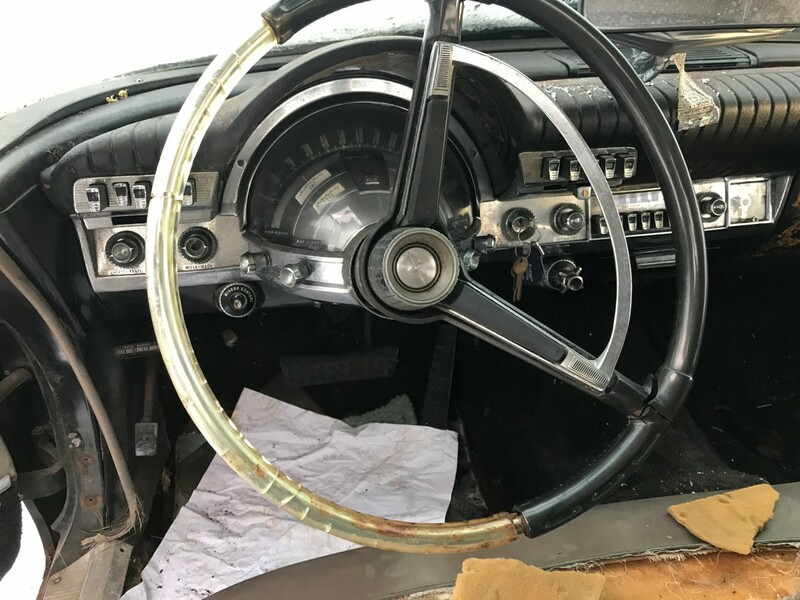 These vintage Chryslers have hands down the best jet-age style instrument panel, with their “astradome” enclosure surrounding the steering column. Combine this with the nifty push-button transmission, you were well on your way to the real-life Jetsons. These cars also featured early electroluminescent lighting, and were quite a sight to behold at night, and the photo below demonstrates. Alas, our featured stray can only look back to these glorious days. One of my favorite Chrysler designs, the father of a good friend of mine had a Newport version, and the car was very striking to my 11/12 year old eyes. And, since it was only a Chrysler product, it was safe conversation around the dinner table. Hmm. I know the front and rear windscreens are leftovers, but I think the greenhouse on this car is nonetheless just about perfect. By comparison, the windshield on the ’63 is an obvious mismatch to the rest of the greenhouse. Did anyone notice that the rear windscreen in the ad is different from the one on the actual car, even though the cars are otherwise identical? What is that about? Hardtop versus 4-door sedan. The backlights were quite different. Great analogy, and so very true. This kitty is far, far too pretty to be left out in the cold. Tom, you’ve sold me on the ’62. I used to be turned off by the front but that side shot shows how beautiful these are! Finding one of those hardtop wagons would be an absolute delight! I’m a big fan of the ’63… Something about it just looks… right. The ’61 is a bit much though, but I do like the ’60. I honestly like most Mopar designs of the ’60s, even the “weird” ones. Hope someone saves this one. As he said the keys are sitting in the car just waiting for someone to come by. Great find. And best for last is certainly right — I think Chrysler dashboards were the best of the 1960s, especially for people who love pushbuttons — in your picture I count 16 of them. The neatness of the dash, though, is contrasted by the awkwardness of the horizontal headlights, which is a feature I’ve never warmed up to. But awkwardness or not, I sure hope this example finds the affection it deserves. The hood hinges look buggered up. Like your writing and your detailed research. Looking forward to more from you. Thanks. That’s your first CC? Outstanding debut, I have to say. Your photos, the selection of ad pictures and your writing would make me think this is your 51st CC. +1 Everything Wolfgang said – stellar piece. Had me wistfully hoping for the best for this example, Tom. Excellent initial effort, and what a fabulous car that definitely deserves some care. In early eps of the Beverley Hillbillies, the oil exec who bought their homestead drove a 4-door hardtop version of this. According to Jeff Godshall (writing in Collectible Automobile years ago) the ’62 Chryslers were the result of frantic last minute scrambling after the planned Exner S-series cars were cancelled. 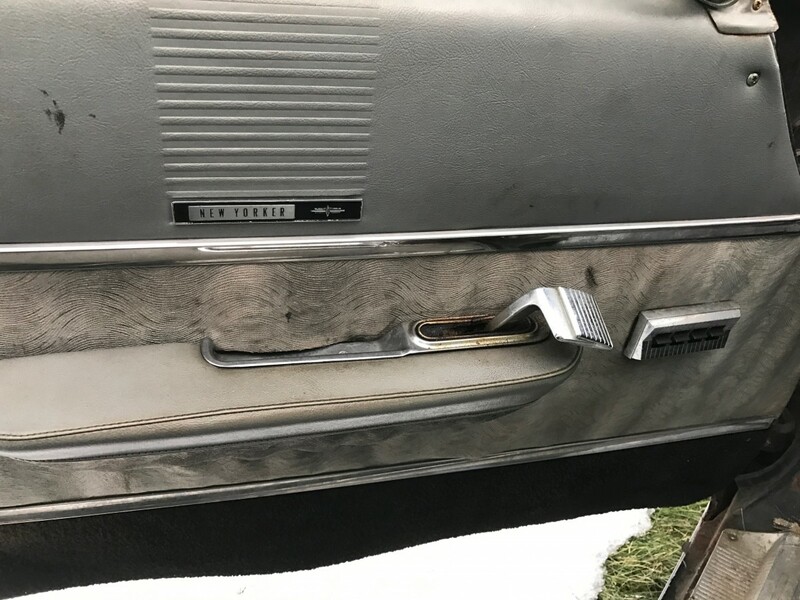 For the Chrysler, they took the rear fenders and rear door of the 1961 Dodge Polara, cut off the fins, plastered on some taillights on top of the fenders, and stuck it together with the front clip of the ’61 Chrysler. You can see from the rear shot the “W” shaped rear end and rear bumper – that came from the ’61 Dodge. 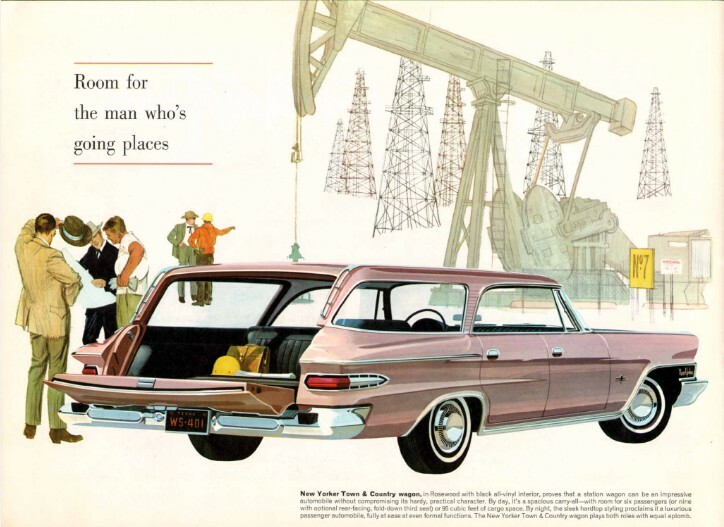 As for the wagon, it’s actually the ’61 Plymouth wagon back end with the bullet taillights removed and some wraparound units stuck on instead. I’ve always liked this design, even if it is something of a hodgepodge from a Dodge. Back when a Chrysler was a viable (and in some ways superior) alternative to the comparable GM car. Agreed. The New Yorker could certainly hold its own with Olds 98 or Buick Electra. And the Newport and 300 matched up quite well with Olds Dynamic and Super 88’s and Buick LeSabre and Invicta. Never as popular as the GM brands though. I recall Chrysler products as quite polarizing at the time. They had their die hard adherents and those that would never, ever consider them. My father was in the latter camp, after his gorgeous ’57 Plymouth Belvedere self-destructed in 4 years. He never considered a Chrysler product again. 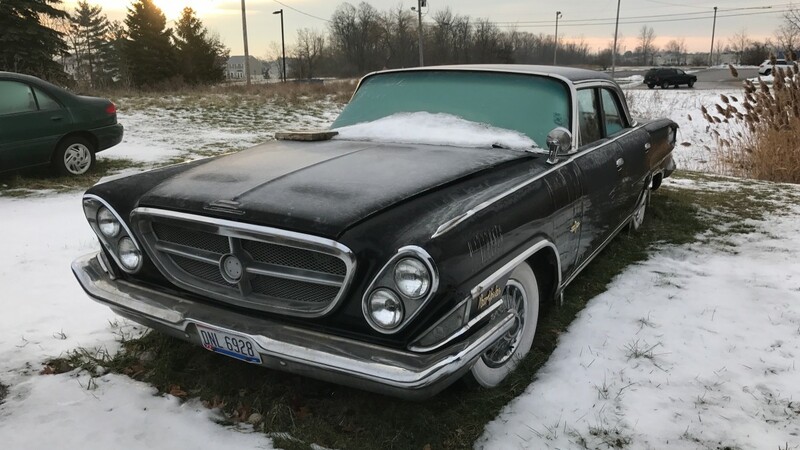 I could not save the 1962 Chrysler 300 that belonged to my uncle. He owned it until 1980, along with a 1965 300L (the last of the classic letter cars, though by then it was little more than trim and a usually tame 413 engine). The reason? Rust, even in California. In San Francisco, if you lived near ocean or bay, salt air could be an issue. He did, and in eighteen years, the trunk on the 300 had rusted through. Not even wanted as a demolition derby car, because of the compromised structure, it wound up going to a scapyard after I took its rims (no rust!) and swapped them with the skinny 13-inchers from a Valiant I had, which looked a little spiffier with the 300’s wheel covers. Probably its engine, strong as ever, went to the crusher along with the bady, because by then everybody who wanted a B-engine wanted a 440 Magnum. I did shed a bit of a tear to see the 300’s magnificent instrument cluster go, though; and the roof on the 2-door didn’t seem to look quite as dated as the sedan’s. There’s a problem with your wheel-switcheroo recollection: 13″ Valiant wheels had a 4″ bolt circle. Chrysler Corp cars larger than the A-body (Valiant/Dart/etc) had a 4-1/2″ bolt circle with a larger central hub. The larger bolt circle was phased in on A-bodies starting in ’73, but 14″ rims had become standard for ’69, so there weren’t any large-bolt 13″ Valiant wheels. I always liked the styling of the `62 Chryslers, even if they were only finless`61s. That spaceship dashboard was, IMHO a lot nicer than the GMs or Fords of that year. An excellent debut! Count me as another fan of the 62. This is also one of the rare cars where I find the roof styling of the 4 door sedan better than the 4 door hardtop. I’ve always loved the ’62 Chrysler. The father of a friend traded in his ’59 Plymouth Fury hardtop, a great car in its own right, for a new ’62 Newport. Gorgeous car. To my eyes, all the styling elements work together. I hope someone gives this beauty a good home. My Mother had one of these. My father bought it for her used, it was 2 years old. A White 4 door hardtop with a blue interior. It was similar to my Aunt Ginny’s 62 Chrysler 300. Hers was White with red vinyl interior a 2 door hardtop much sportier and faster. One of my little sister’s vivid memories of the New Yorker is how we almost decapitated my Grandfather who had his head out the window when someone accidentally pressed on the window switch, which is probably why all power window switches now have to be pulled up to activate rather that pushed down by leaning your arm on the arm rest. I loved it and was just of driving age. I got to drive it a few times and I was hoping for it to be a hand me down but no such luck. It was traded in on a new brand of car that I never herd of before. “What the hell is a Toyota?” What do you mean it’s Japanese? A brand New Toyota Corona Mark II sedan replaced our Luxurious New Yorker. Boy, I was pissed. I should of asked my Aunt to hand down her 300 but I was starting to get distracted by the changing times of the Late 60’s and lost interest. I guess the New Mark II Corona was the equivalent of the New Yorker in Japan. It was the only “New” Car my father ever bought in his lifetime. It was fun watching my Mom shift a 4 on the floor, But I loved the Big Chrysler. I have been searching for a 62 Chrysler 300 or New Yorker for about 20 years but haven’t found one that I like or could afford. There are a few 62’s in the North Berkeley California area that I see from time to time but none for sale. This hard top coupe is the pinnacle of ’62 Chrysler to me . timeless, conservative and well balanced beauty . IIRC the 413 C.I.D. V8 was a truck engine, non ? . In 1970/71 the C.O.L.A. bought a fleet of three yard dump trucks with 413’s and mostly Allison slush box trannies ~ great, impossible to kill trucks . At that same time a High School buddy bought an E Body Challenger and stuck a modified 413 into it, amazingly fast and handled well too . I would not describe the Chrysler 413, although it was used in some truck applications, as a truck engine. It was part of Chrysler’s RB big block series and was sold in various displacements, 383/413/426 (wedge)/440. All of these engines have the same 3.75 inch stroke, with the 413 having a bore size of 4.1875 inches. There was another Chrysler big block series, the B series, which had a different deck height and a 3.375 inch stroke. It was the 383 CID version of the B series that powered Road Runners and many others in the late sixties and early seventies. The RB series 383 was only used for a couple of years in the late fifties when it was generally superseded by the 413. Most American car engines were used in truck applications. For heavy duty truck use, they typically had specific parts for the job. But the basic engines were mostly the same. So none of them are “truck” engines except for the specific truck versions, or engines specifically designed for truck-only use, like the RB big-block Chevy (366/427) and others. The 413 was a natural evolution of the RB 383. FWIW, the 440 was never used in medium/HD trucks, as the 413 had been well developed for that role, and Chrysler apparently wasn’t motivated to develop the specif parts for it. Or perhaps the 440 block was somehow not so well suited for the job. IIRC, the 413 was last used in cars in 1965. It would not surprise me if Lynn Townsend considered it a “free” engine with paid-for tooling, thus perfect for the low manufacturing volume of Dodge trucks in those years, instead of upgrading to the newer 440. All I ever knew was the 413 CID is a stout if thirsty mill . In Medium Duty trucks it used a trouble free direct drive starter instead of the Hamtramk Hummingbird . My dad had the whole plume – a ’61 4-door hardtop version of this car, in medium blue. 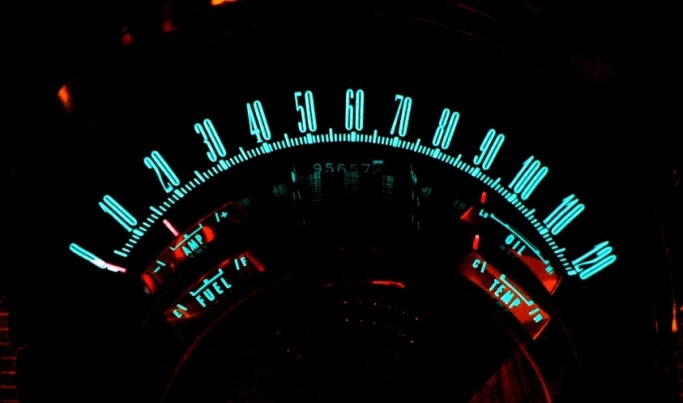 Those “astrodome” instrument clusters were a work of art. Great write-up, Tom, looking forward to more! Wow, that’s a nice looking hardtop wagon! Tough call between that and the finny ’61. The New Yorker and 300’s were the most appealing, the stripped down Newport shouted “big, cheap Chrysler”. Preference here for the four door hardtop, this sedan greenhouse was seen on the cheapest Plymouth and Dodge the two prior years. Great for the Taxi and mass-market basic sedan, far less so for a top-of-the-line model. Good article and photos indeed especially the analogy. The rusty S-10 with a cockeyed bed brings back memories of Central New York. Check out the side view. Now those, gentlemen, are whitewalls! Yes, I saw those wheels. I have to look past them. Not only are those whitewalls more suitable for 1952 (1962 was the first year for the thin whitewalls we got so familiar with in the 60s and 70s) but it also has those 80s FoMoCo fake wires, which are the worst fake wire wheelcover design ever. I well remember the once common Kelsey-Hayes optional wire wheels that graced so many Chry-Co products, these look fine to me in lieu . Don’t forget the torsion bars. The 1970’s ad. “An Imperial ride at a New Yorker price.” Must have been pretty frantic with the 11th hour sheet metal changes. Having to stamp new body parts, At least the Mopar weird ones, weren’t around long. With smaller, funny looking, Plymouth Furys offered in ’62, it probably led to more ‘cheap’ Newports sold. Despite the fact I find the car to be rather ugly in the front I never like to see any old beastie sitting outside in the The Elements just to rot away. If it were close by where I live I’d have it parked in the second spot in my carport. It’s laying bare and car-less at present. Sad to see an antique as a stray. This car has been parked outside a repair shop for as long as I can remember. I don’t know the owner, but I’m pretty sure that at this point they would give the car away for free just to get it off their property. If anyone is seriously interested, I can make an inquiry. The car is a little bit rougher than it appears in the pictures. Where is this car? I see the Ohio tags are from Summit county; are they still valid? OK, now that I’m able to see this on my 27″ monitor I can see they’re no longer valid. It’s a really neat car. Brunswick, Ohio (about 30 minutes south of Cleveland and 30 minutes west of Akron). Yup, I grew up in the Youngstown area. Those southeastern suburbs of Cleveland are my old stomping grounds. Great article! Our elderly neighbors employed a cleaning lady who drove one of these. Her New Yorker sedan was light metallic purple with a white roof. Even in 1973, I thought that the instrument panel looked like something out of the space module! The 1962 Chrysler was another sign of long-term trouble for Plymouth. The 1962 Chryslers sold well because buyers turned off by the shrunken, strangely styled full-size Plymouth were quickly shunted over to the Newport by desperate sales representatives. (Dodge dealers initially had no alternative to their downsized Darts and Polaras – hence the mid-year Custom 880 in the size buyers expected at that time). Unfortunately, every time Plymouth tried to follow Ford and Chevrolet into the “low-cost luxury” league, its offerings kept bumping up against the lower-rung Chryslers just across the showroom floor. By the mid-1970s, Chrysler Corporation had largely given up on Plymouth, and simply badged the Cordoba and LeBaron as Chryslers. By 1980, the marque that had once been a proud member of the old “Low Price Three” was well down on the sales charts. I always have loved the 60-66 Chrysler’s half round speedometer-instrunent panels. Some of the most elegant ever made IMO. This is the only car with canted headlights that I ever found attractive. I like the simplicity of the rear end also, with the wrap around tail lights. This particular example of the sedan model just looks right to me. There is something athletic and purposeful to the design. I also like the first of the LH style New Yorkers also. Those are probably one of my all time favorite cars. Love the styling and they were good performers. The few that I have seen in the flesh have all been hardtops. I got to drive a non letter 300 as a kid in the mid ’80s. It was no slouch. There’s one of these in Oakland. In teal. 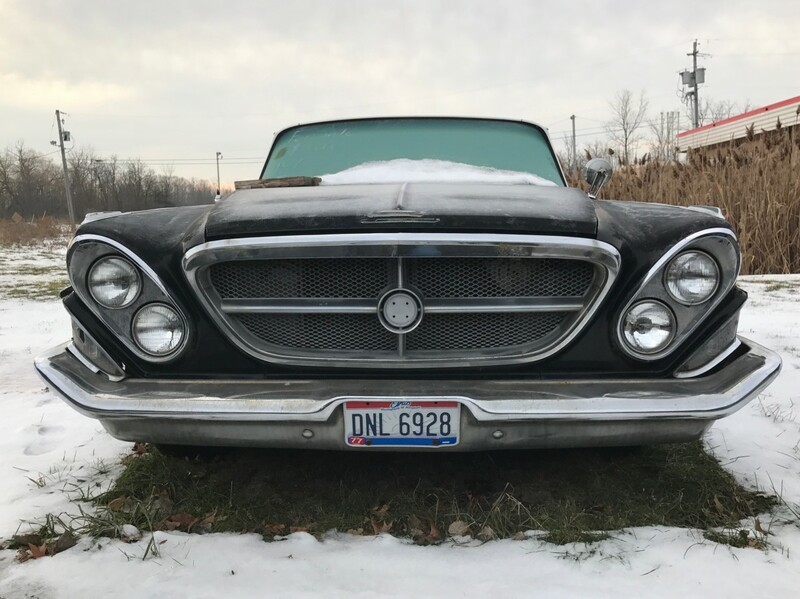 Sad to see the beautiful, black 1962 Chrysler New Yorker neglected, but that was a nice report on that fine car. Just as a point of reference, the Virgil Exner “Forward Look” actually began with the 1955 Chrysler line, but I think what you meant by the comment “Chrysler scored a home run with its “Forward Look” styling from 1957-59,” comment was that sales took off with that series. The sales increase in 1955 over the “designed-by-committee” earlier 1954 Chrysler cars was the most spectacular, but by the early 1960s, sales began to decline. By the way, Virgil Exner will certainly go down as one of the best industrial stylists, but he was basically thrown overboard when Chrysler decided they wanted Elwood Engle’s more conservative, cleaner designs for the corporation’s cars. Both designers had memorable designs at Chrysler! Love these–I’m a huge fan of that canted-lamp front end, and I think it works quite well both with fins on the ’61 and without on the ’62. 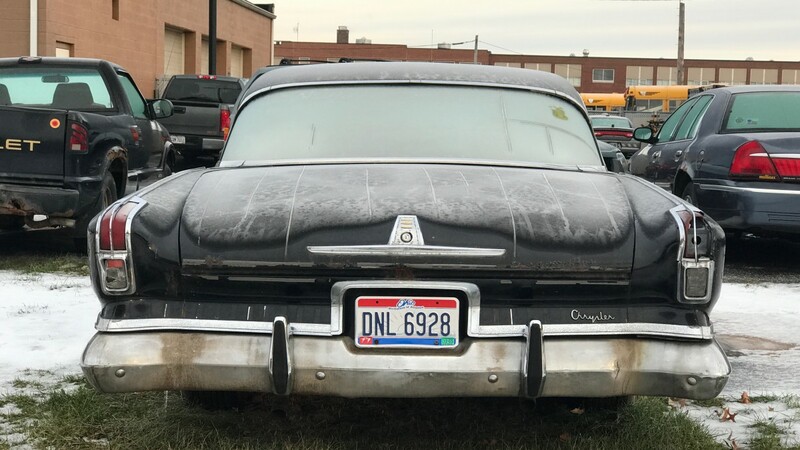 Shame to see this car sitting neglected out in the elements, but I’m rather astonished that there is no visible rust on an Ohio car. If the underbody isn’t toast, then this car looks eminently restorable. I really hope someone can get it back on the road. I’m assuming that the 12-05 plate sticker is the last time the car was registered, but what’s the significance of the red ’77’ sticker? Is that the door opening lever sticking out of the armrest? Diagonal headlights … 50s styling? I honestly don’t recall a single car that had the V configured headlights like the 1962 New Yorker. Can always be wrong – but I just flat-out don’t recall one.